Ryder always smiles and gets excited whenever he sees Ryder. His arms fly straight out, all stiff as he tries to will his body over to his brother. "Make him get me!" Lucas will say. I hold Ryder up and he picks up his little feet, one at at time and "walks" over to Lucas where he will walk up to him and knock him over. Lucas loves this game. "Make him do it again!" Lucas makes up songs and sings and dances for Ryder. Ryder laughs and laughs until he gets hiccups. Ryder is getting his two bottom teeth. They are both just barely poking through. I wonder who will get all their teeth first? It must be a brother thing. Cutest, cutest, cutest! It's so sweet that he plays with him so much and that they love each other like that! I know I've said it before ... but your children are absolutely adorable! I love these photos as well ... especially the last one - very sweet! My two boys love each other too. It must be a brother thing. Okay, just LOVED this post. That third picture is just so darling - well, all of them, but I LOVE that one so much. They'll be friends forever! Ah, that is some great brotherly love. 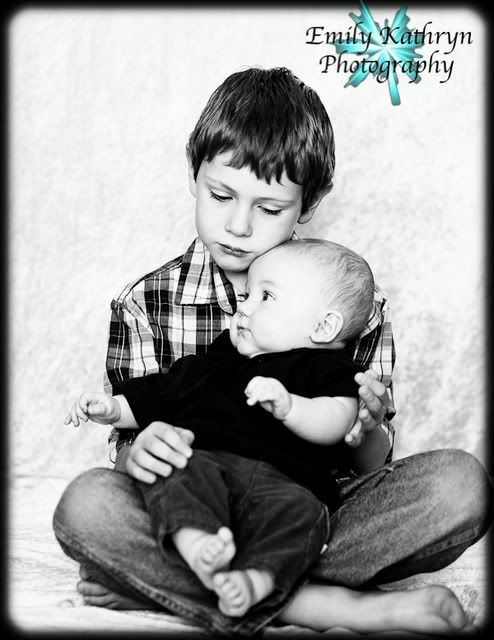 I remember when my boys loved each other like that at similar ages. Now they show their love by punching each other. Sooo cute! 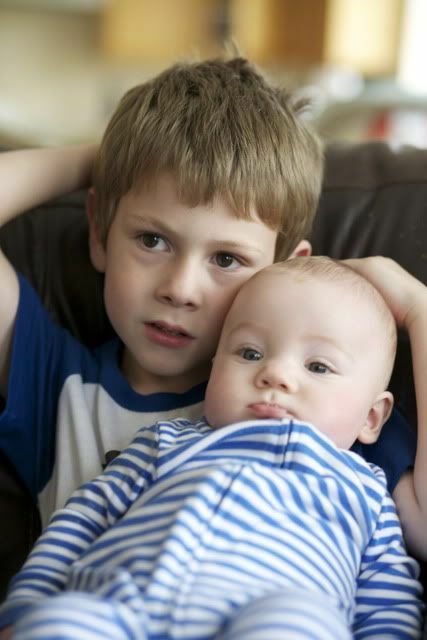 Ryder has got a great big brother! They are such cuties. I wish my boys played and loved on each other like that. Maybe someday. LOVED the last two posts about your kids! That is so cute! And Ryder is getting so big! Precious! That is so cute! My girls adore each other...something I was worried about with them being almost 6 years apart. Ooooh. Those are so sweet! 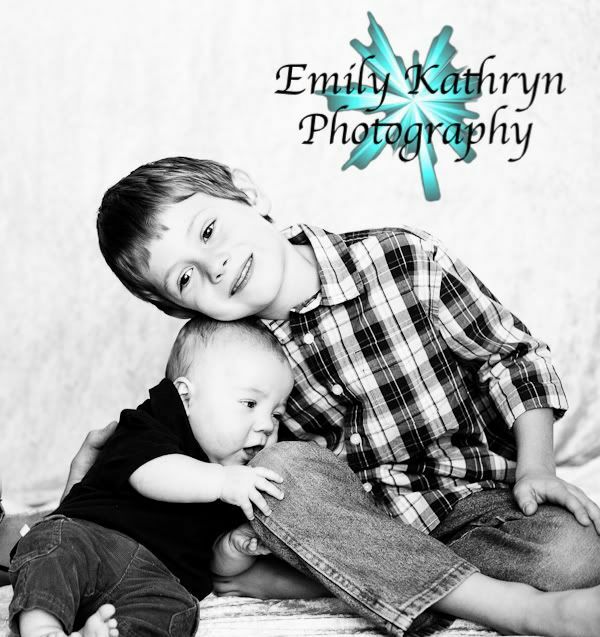 These photos are just so stinking cute I can't stand it! Oh my god aren't they adorable together! Absolutely adorable! And I have to tell you, Ryder is my very favorite boy name that we haven't used. Often I wish I could have another boy, just so I could use it! ;O) Love it. So much cuteness! I love brothers!!! And those pictures are GORGEOUS!!! Oh my goodness! Those are the sweetest brothers! Too funny that they are both getting their bottom teeth. It makes me a little sad when my kids get their adult teeth! I ADORE that picture of both the boys wearing blue! The smile on Ryder's face is contagious! Oh, that is adorable. 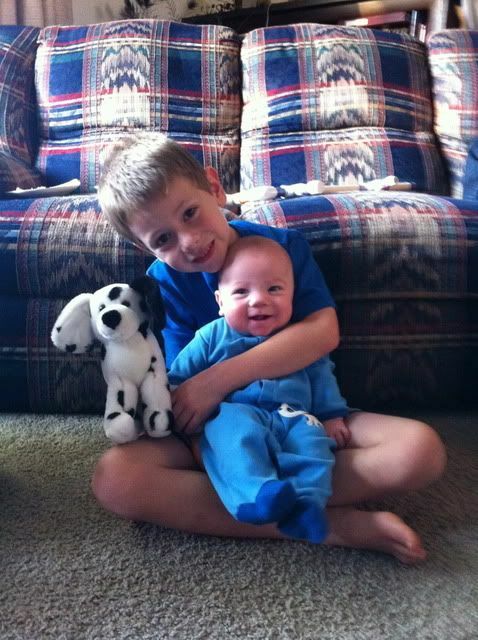 I bet Lucas adores having a little brother. How good he is to him. Brothers are the best.